The French Garden™ by FTD® employs lush, green plants to create a gift ideal for any of life's special occasions. 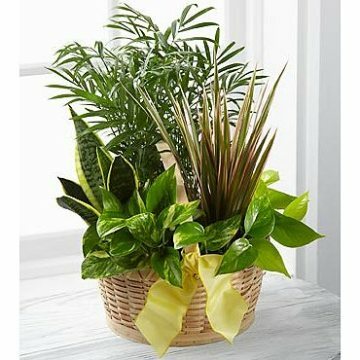 Containing a varied assortment of 6 green plants, this dish garden arrives presented in a natural round woodchip basket accented with a yellow wired taffeta ribbon to create a wonderful way to send your sentiments across the miles. Great to send for any occasion - or no occasion at all! This selection may contain: a mix of green and blooming plants in a basket. All Florist delivered products and containers may not be exactly as shown. In each case the individual florist may make substitutions of equal or greater value. For same day delivery, orders must be received by 12pm CST.